Drug-related arrests, convictions, and incarcerations continue to increase each year. The criminal justice system faces the problem of how to handle these high numbers of people with substance abuse and addiction issues flooding the system. As the opioid epidemic unfolds, correctional institutions are looking for best practices that they can use to help handle the ever growing demand for substance abuse and addiction treatment. The following are a list of "top-shelf" resources that have been hand-picked by our library team about the impacts of Juvenile Justice in the criminal justice system. For ease of use we have broken down this vast topic into more specific categories for your convenience. Click on a subject heading below to browse all the recommended resources. TCU Drug Screen 5 is an updated version of the TCU Drug Screen II and is based on the most recent Diagnostic and Statistical Manual of Mental Disorders (DSM-5). The TCU Drug Screen 5 screens for mild to severe substance use disorder, and is particularly useful when determining placement and level of care in treatment. INDIANAPOLIS -- With a single drop of blood, hospitals and law enforcement may soon be able to detect concentrations of synthetic illicit drugs. Modern street drugs found on the market such as Spice and K2 do not show up in regular urine drug screenings, and people continue to overdose on them. The drugs usually are not detected until after a person dies or authorities intercept the transportation of them. One IUPUI professor and his team are working to change that. The method can potentially be applied to a variety of substances. The researchers plan to make a business case for the technique as a safe, rapid and highly accurate method of running a variety of drug tests in the real world. As the title implies, the objective of this fact sheet is to provide drug court professionals with a scientifically based justification for discontinuing the interpretation of urine drug levels in an effort to define client drug use behavior. As the premise of this document is not without some controversy, clarification of its intent seems warranted. NEARLY FIVE MILLION adults are under community supervision (i.e., probation or parole) in the United States (Maruschak & Parks, 2012). Many of them are placed under community supervision due to drug-related criminal offenses. According to the National Center on Addiction and Substance Abuse (NCASA, 2010), approximately 70 to 85 percent of all convicted offenders have violated drug laws, were intoxicated at the time of the offense, committed the offense to support a drug habit, or have a history of drug addiction. In a guest article, the district attorney in Essex County, Massachusetts, details a local effort to offer treatment on demand to non-violent offenders rather than prosecuting them. Solano County Health and Social Services is the recipient of $6 million to provide mental health, substance use disorder treatment and diversion programs for individuals in the criminal justice system. The funds will be distributed during a three-year period. Tuesday, the Solano County Board of Supervisors unanimously approved the acceptance of the grant funding and the anticipated expenses during the first year. A bill recently introduced in the state Legislature would require police and first responders to don protective equipment before going anywhere near an overdose scene. STOUGHTON – Just a puff from the top of an evidence bag or a hand in the wrong place can be enough to put a police officer’s life at risk. A collection of the NDCI's Fact Sheets covering a number of different Drug Court topics. Given the devastating effects of the opioid crisis and the growing support for both the drug court model and medication assisted treatments (MAT), the Ohio Department of Mental Health and Addiction Services (OhioMHAS) along with the Supreme Court of Ohio as well as other State agencies and certified drug courts designed an innovative program to provide addiction treatment, including MAT, to non-violent adult offenders with opioid use disorder, alcohol use disorder, or both who are entering drug courts throughout the state. A Bureau of Justice Assistance (BJA) funded program provided by Advocates for Human Potential, Inc. (AHP) in partnership with Treatment Alternatives for Safe Communities (TASC) and AdCare Criminal Justice Services (ACJS). Opioid use disorders are highly prevalent among criminal justice populations. According to data from the U.S. Department of Justice, approximately half of state and federal prisoners meet criteria for substance use disorder. Even so, there has been reticence in criminal justice settings to using medications (methadone, buprenorphine, naltrexone) to treat opioid use disorders. In national surveys, utilization of these medications is very low in criminal justice settings, including drug courts, jails, and prisons. New York City is launching an opioid recovery program that dispatches “recovery coaches” to emergency rooms to counsel overdose survivors on how to avoid a second brush with death. The California Legislature provided the California Department of Corrections and Rehabilitation (CDCR) $10.4 million over two years to implement a contraband interdiction effort. Beginning in fiscal year 2014-2015, CDCR implemented the Enhanced Drug and Contraband Interdiction Program (EDCIP) demonstration. 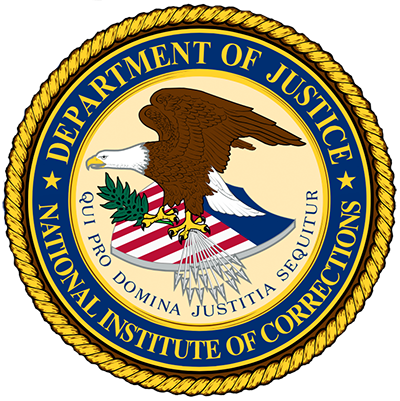 The program involved interdiction efforts at 11 of California’s prisons; eight receiving a moderate intervention and three receiving an intensive intervention. Heroin, once the top illicit drug in prison, has been replaced by the cheaper and easier to smuggle suboxone, which was meant to help opiate addicts. NEW HAVEN — When Dave Mason left jail in October 2015 after his 14th criminal conviction, the odds were good that he would soon end up dead. A man with a longtime heroin addiction, Mr. Mason was entering one of the deadliest windows for jailed users returning to the streets: the first two weeks after release, when they often make the mistake of returning to a dose their body can no longer handle. PHOENIX - The Arizona Department of Corrections launched a new drug program this week which aims at fighting Opioid abuse head-on. MANSFIELD — On a summer Friday night at the Richland County Jail, a Mansfield police officer brought in a 36-year-old Mansfield woman on a drunkenness charge. Police and jail staff thought she'd probably just had a little too much to drink. They could smell the alcohol on her, and she couldn't stand up on her own. She told jail staff her name and age and that she'd been in the jail before. But when she was taken into the restroom on July 14, an officer could soon tell something was wrong, something more than just drunkenness. As the epidemic of opioid use in the United States continues to shift from prescription opioids to illicit drugs, more people living with opioid use disorder are encountering the criminal justice system. Most US correctional facilities do not continue or initiate medications for addiction treatment (MAT). This is especially unfortunate given the higher rates of opioid overdose immediately after release from incarceration. Many publications over the last decade have documented the alarming increase in use and abuse of prescription opioids and heroin (Cicero, Inciardi, & Munoz, 2005; Davis, Severtson, Bucher-Bartelson, & Dart, 2014; GAO, 2009; Paulozzi, Budnitz, & Xi, 2006: Pletcher, Kertesz, Kohn, & Gonzales, 2008; Reifler, et al., 2012; Schneider, et al., 2009). This report examines the prevalence of opiate addiction in the criminal justice system, its devastating consequences, and the widespread denial of access to one of its most effective forms of treatment: medication assisted treatment (“MAT”). The report then analyzes the circumstances in which the denial of MAT violates Federal anti-discrimination laws and the United States Constitution. Medication Assisted Treatment in the Connecticut Department of Correction PowerPoint presentation. Incarceration is a relatively common experience among the estimated 15.6 million opioid-dependent adults in the world.1 In the US, it has been estimated that between 24% and 36% of opioid-dependent adults cycle in and out of jails each year.2,3 Incarceration of these individuals often results in opioid withdrawal syndrome, which, at a minimum, should be treated humanely.1,4 Beyond safe and effective opioid withdrawal treatment, there are three major opportunities to provide effective pharmacotherapy to inmates. Deputy Director Leary highlights examples of MAT programs that are viable and beneficial components of prison and re-entry services. Medication-assisted treatment with Narcan improves both public health and public safety. The trend towards medicationassisted treatment reduces harm, saves lives, and meets the immediate need of an individual in crisis. The question becomes: what happens next? Launched in 2014, the Law Enforcement Naloxone Toolkit (https://bjatta.bja.ojp.gov/tools/naloxone/Naloxone-Background) includes sample data collection forms, standard operating procedures, law enforcement training guides, community outreach materials and memoranda of agreement — all of which have been used by other law enforcement agencies and can be downloaded by agencies and customized for re-use, according to Tara Kunkel, Senior Drug Policy Advisor at the U.S. Department of Justice’s Bureau of Justice Assistance (BJA). COLUMBIA — Inmates suffering from addictions to heroin and prescription pain pills may soon have new treatment options in South Carolina prisons. The S.C. Department of Corrections has launched a pilot program where the agency will administer Vivitrol — one of three federally approved treatment drugs for opioid addiction. State Corrections Director Bryan Stirling said the agency hopes the treatment effort will help incarcerated individuals suffering from addiction while behind prison fences, and allow them to avoid heroin and pain pills once they are released. There is a national opioid epidemic and one intervention to help those suffering from an opioid use disorder (OUD) is medication-assisted treatment (MAT). MAT is the use of medications in conjunction with behavioral therapy as part of a long-term treatment regimen. There are three main MAT medications used today—methadone, buprenorphine, and naltrexone. Research has shown MAT, in particular the use of methadone or buprenorphine, is considered an evidence-based practice to treat OUD. Studies indicate those in MAT have better outcomes than those who engage in therapy alone. "Extended-release naltrexone, a sustained-release monthly injectable formulation of the full mu-opioid receptor antagonist, is effective for the prevention of relapse to opioid dependence. 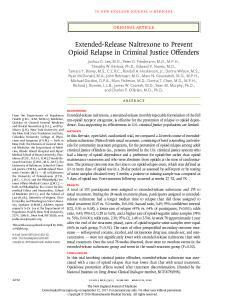 Data supporting its effectiveness in U.S. criminal justice populations are limited … In this trial involving criminal justice offenders, extended-release naltrexone was associated with a rate of opioid relapse that was lower than that with usual treatment. Opioid-use prevention effects waned after treatment discontinuation" (p. 1232). People who are leaving incarceration face a significantly higher risk of relapse, overdose, and overdose-related death than people in the general public. Because of these odds, reentry is a critical time to provide rapid access to pre- and post-release treatment as well as informed supervision to people who have opioid addictions. This resource center from the Bureau of Justice Assistance’s (BJA) Comprehensive Opioid Abuse Program (COAP) Resource Center is an online clearinghouse of information, training, and other resources that can support a variety of state, local, and tribal users, including BJA COAP grantees, policymakers, partner agencies and associations, peer recovery coaches, and families affected by the nationwide opioid epidemic. The White House National Security Council coordinated an Interagency Working Group (Working Group) comprised of ten federal departments and agencies to create the Fentanyl Safety Recommendations for First Responders document (published in November 2017) and the Fentanyl: The Real Deal training video based on the document. Federal agencies collaborate with each other and with some foreign governments, such as China, Mexico, and Canada, to combat the production and availability of illicit synthetic opioids. Our recent report looks at some of these cooperative activities, such as sharing information on emerging trends and helping to expand the regulation of illicit substances. More people died from opioid-related deaths in 2015 than in any previous year. This record number quadrupled the level of such deaths in 1999. Unlike the heroin and crack crises of the past, the current opioid emergency has disproportionately affected white Americans—poor and rural, but also middle class or affluent and suburban. This association has boosted support for preventative and treatment-based policy solutions. Funding will help expand treatment and recovery services to pregnant and postpartum women who are struggling with substance abuse. The Trump administration on Friday announced that the Health and Human Services Department has awarded $144.1 in grant funding for opioid abuse prevention and treatment around the nation. That grants are being administered through the Substance Abuse and Mental Health Services Administration. According to the CDC, between 2002 and 2013, the rate of heroin-related overdose deaths nearly quadrupled, and more than 8,200 people died in 2013. The Substance Abuse and Mental Health Services Administration (SAMSA) is also reporting rapidly rising heroin use. This is attributed to an epidemic of prescription opiate addiction that operates as a gateway drug for heroin. Erie County, N.Y. Executive Mark Poloncarz says his jurisdiction was on its way to 550 overdose deaths in 2016. Here’s what the county government did to keep that from happening. In 2015, overdoses related to opioids left 256 residents of Erie County, New York dead. And, at the rate things were going in the early months of last year, local officials were preparing themselves to see that number more than double. Prescription drug misuse is second only to marijuana use as the nation's most commonly used illicit drug.1,2 Although prescription drug misuse is common in the United States, the majority of people (87.2 percent) who take prescription pain relievers do not misuse them.2 Understanding the prevalence of and reasons for prescription drug misuse has major public health implications. Policymakers can use this type of information to help inform their assessments of substance use prevention and treatment needs in their communities. Opioid mortality rates may be 24% higher than the official stats. It’s hard to solve a problem if you don’t understand its magnitude. And thanks to faulty data collection, America seems to have been greatly underestimating the severity of its opioid epidemic. According to a new study that corrected the rates, opioid mortality rates in 2014 were 24% higher than the official statistics. Heroin mortality rates were 22% higher. What will it take to tackle our nation’s opioid epidemic, with more than 140 Americans dying every day from overdoses of prescription opioids and heroin? Money is important—federal and state governments are spending billions through Medicaid, the Substance Abuse Block Grants, and the recent 21st Century Cures Act. But funding is only part of the challenge. We also need more effective treatments and better ways to deliver services to those in need. In other words, we need a learning and innovation strategy to accompany and hone a treatment strategy. Analytics could help us stem the opioid crisis. We just need to solve a few red tape and data problems. At 10am on a Thursday, Alan Oberman’s methadone clinic in Pleasantville, New Jersey, is bustling with people and life. Parents are yelling, babies crying, and smokers smoking. With the beach nearby and fresh-cut grass in the graveyard across the street, it feels like a neighborhood and smells like summer. The United States is experiencing an epidemic of drug overdose deaths that cuts across economic, racial, and geographic boundaries. In the midst of this devastation, people are struggling to find ways to save the lives of their community members. While the “war on drugs” created tough enforcement policies that resulted in a bloated justice system, there is increasing momentum for a smarter and more compassionate approach to people who use drugs. The opioid crisis sweeping the country is putting a growing financial and emotional strain on many communities. More than 4,000 people died from unintentional drug overdoses last year in Ohio alone.Many coroners in the state say the death toll will be higher this year. CBS News correspondent Tony Dokoupil visited Middletown, Ohio, where the sheriff is refusing to allow deputies to carry the opioid antidote naloxone because of safety concerns. Massachusetts' highest court soon takes up a controversial case that raises provocative questions about the criminal justice system and addiction. The case asks if it's constitutional to require someone on probation to remain drug-free. Some say it could be one of the most important cases before the state Supreme Judicial Court in the past decade. Presents prevalence estimates of drug use, drug use disorders, and participation in drug treatment programs among state prisoners and sentenced jail inmates, including trends in drug use over time by demographics and most serious offense, drug use at the time of offense and whether an inmate committed the offense to obtain drugs, and comparisons to the general population. Data are from BJS's National Inmate Survey, conducted in 2007 and 2008-09.